This document may be transcribed, and reprinted in its entirety, so long as it is not intended for resale. The Sacred Order of Knights of the Rose is a diverse group of men and women who are committed to understanding and sharing the Gnostic path of knowing one's Self fully by experiencing our own Inner Wisdom. Our undertaking is to assist the esoteric mission of the original Knights Templar by working to show the common links between the spiritual traditions of the East and West. At the time of the original Knights Templar the world was not ready for the fusion of east-west spirituality that they identified. Their subsequent downfall and suppression was at least partly precipitated by their synthesized "heretical" doctrines and rites. Some of the Secret Societies that developed out of the Templars continued their work. However, the mission of these organizations is, and was, also blocked by a number of power hungry authority figures governing the sacred and profane institutions of the West. Today, due to the increase of higher vibrational frequencies that we are experiencing and add to that the vast shift in consciousness that is occurring, many of these authoritarian institutions are crumbling to their foundations and their leaders are being besieged with controversy and lawsuits. NOW is the time that we present-day Sacred Order of Knights of the Rose’s mission is more crucial than ever. In our endeavor to continue this important work of our predecessors- the Knights Templar, we, the spiritual warriors of the Sacred Order of Knights of the Rose, have adopted the following Five-Point Plan. 1. We seek to reveal the common threads that we believe are shared all religions, thereby creating more peace, love, tolerance and understanding between the religions, along with a sense of kinship and knowing that we are all One. 2. We seek to reveal that not only are there links between all the world's religions but to also reveal that many of these religions began as pure spirituality before being dispersed around the globe and then being clouded over by regional and hierarchal dogmatic teachings. 3. We understand that the path of pure spirituality is a path involving purification and transformation (alchemy) that culminates in the uniting of the male and female polarities and the opening of the heart, which then activates the inner centers of divine wisdom (gnosis). We understand that everything is alive and responsive- interconnected along the web of life. 4. We teach that there are many spiritual paths involving purification and transformation that open people up to their latent gnosis. These teachers of true spirituality taught literally hundreds of different paths that culminate in gnosis. Each path was designed for a specific temperament. 5. When enough people have opened their hearts and centers of gnosis, and are experiencing true spirituality, all dogmas will then dissolve, and tolerance of spiritual belief and practice will be attained. The Sacred Order of Knights of the Rose is a non-Masonic/ non-secular organization dedicated to the SACRED GNOSTIC TRUTH and is loosely based on the Templar Knights of old. The Sacred Order of Knights of the Rose is not a mainstream Christian Templar organization but rather a very enlightened “Order of Gnostic Knights” that is not afraid to say that the Ancient Knights Templar were nothing less than Gnostic Knights that believed that before any form of catholicism, and christian patriarchal religion arose, there was a pure but underground stream of succession of the Gnosis. The ancient knights of the Temple studied many esoteric branches of spirituality and discovered that true divinity resides within all human beings. The true God the Father is known in reality to the Sacred Order of Knights of the Rose as the “Divine”, and has gone by many names in many spiritual belief paths. The Mother Is the dualistic aspect of the Father, it is the Earth we are born of. The Sacred Trinity consists of the sacred Father Divine, Mother Earth, and each one of us as the Child, born of both. We believe the ancient Templar’s of Gnosis understood this. 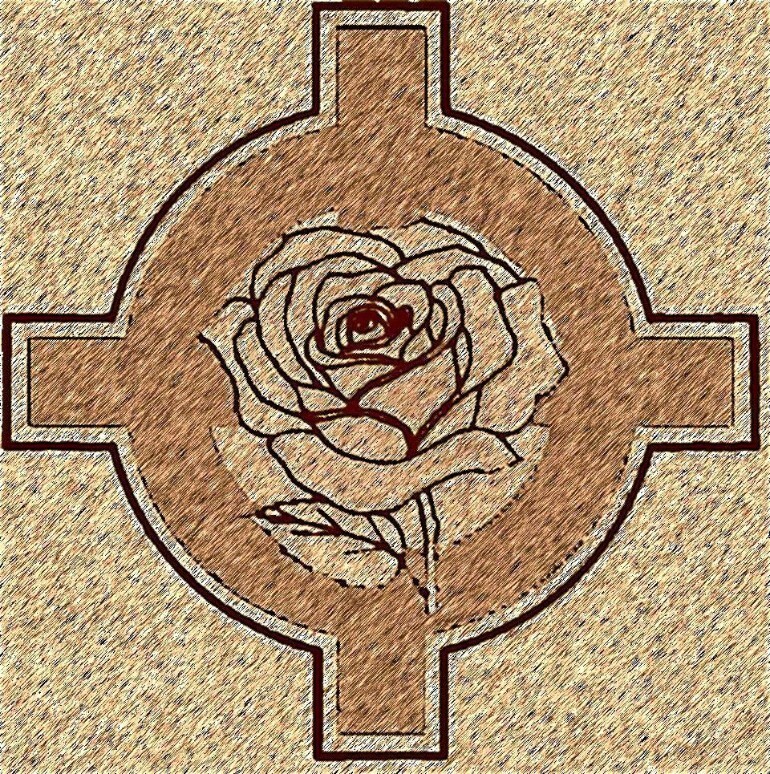 Today the Sacred Order of Knights of the Rose was created and has survived to carry on the true and untainted Gnostic Traditions. We believe fully in the true power of the Divine (both Mother and Father) which has been the underlying force behind the Knights Templar and the very fabric upon which was spun all true but Occult (hidden) and Esoteric Spiritual belief systems. We are the Spiritual Warriors of the Sacred Trinity and our Ancient Mysteries have many roots in the Occult traditions of both the East and West. Today we exist within both the eastern and western mystery school traditions. Today, we acknowledge the Gnostic lineage of the ancient Knights Templar and strive to find the Inner Truth to these mysteries as we understand Gnosis as it unfolds to us. There have been, through- out history, Masters of this Gnosis. Jesus the Christ (Anointed One) and Mary Magdalene (his mate/wife) were two of those masters. Today, the Sacred Order of Knights of the Rose are an order that admits both genders knowing fully that it is the divine spark within the Soul that really is important. We are the esoteric custodians of the Hidden Traditions. Our goals today are the same as the original order of Gnostic Knights Templar in that we seek to unify the Esoteric and Occult Orders into a One World Spirituality mind frame or consciousness based on looking for similarity in all things, and tolerance. For far too long has the underlying symmetry between all of the spiritual schools of thought been suppressed by mainstream religion, it is time for us to reclaim our rightful spiritual inheritance as the expounders of the Gnosis and as those that present the truth in due and esoteric form. If what we present here is of interest to you and is also how you yourself have felt is true then you are free to apply for membership in the Sacred Order of Knights of the Rose. "He who has ears, let him hear!" Gnosis is a feminine Greek noun, which means "knowledge." Gnosis is the common Greek noun for knowledge (in the nominative case γνῶσις f.). In the context of the English language gnosis generally refers to the word's meaning within the spheres of Christian mysticism and Gnosticism where it signifies 'spiritual knowledge' in the sense of mystical enlightenment. A common characteristic of some of these groups was the teaching that the realization of Gnosis (esoteric or intuitive knowledge), is the way to salvation of the soul from the material world. Gnosticism includes a variety of religious movements, mostly Christian in nature, but not limited too. The Sacred Order of Knights of the Rose is "dedicated to advancing the study, understanding, and individual experience of Gnosis." Admission is free and will be discussed in detail further on. GNOSTICISM IS THE TEACHING based on Gnosis, the knowledge of transcendence arrived at by way of interior, intuitive means. Although Gnosticism thus rests on personal spiritual experience (religion is of man- spirit is of God Creator). “It is through our search for knowledge that we act with wisdom and become POWER-full!” -Brother Bartholomew, Sacred Order of Knights of the Rose founder. There is no doubt that the intelligence of the heart, which we call “faith,” is an essential key to any authentic spiritual development, yet, quite clearly, this line of thought verses speaks of something more than faith – it speaks of direct spiritual and mystical experience of the Christ (which we see not as a specific person, but as a state of being available to each and every one of us), and that points to Divine Gnosis, a state of Divine Illumination. This defines “salvation” or “redemption” as understood by Gnostic Christians (not to be confused by the Christian dogma of St. Peters lineage, but more so the conceptual lineage of Mary Magdalene) – it is an enlightenment experience that liberates the soul, and the evolution of the soul to Christ Consciousness, as exemplified by Yeshua ben Yosef or Jesus the Christ. We are set upon the Gnostic Path by faith: faith in the Divine Incarnation and the Great Mystery revealed in the events of the Gospels, both Christian and non-Christian, both Gnostic and secular, and by faith in the Light-indweller (the Christ in us). Yet, ultimately, it is through Divine Gnosis that we experience “salvation” – hence, through Self-realization in Christ. The Gnostic Path, in essence, is this Path of Initiation; the Way to Christ Consciousness, the Christ within. It is this Christ within that we feel Jesus truly wished for us to understand as the Son of Man; that each of us is the Son/Daughter of God and when we find the Christ within we truly are King/Queen of the Kingdom of Heaven. In short Christ is not one person but a concept and place of being or enlightenment. Gnostic teachings (which can come from many sources but is ultimately realized by the Self), a Gnostic teacher and Gnostic circle serves to encourage and support the spiritual life and practice of the aspirant, and from our participation in a living tradition we receive teachings on the spiritual life and instructions in spiritual practice – the entire aim of Christian (in its truest form) Gnosticism, or any authentic wisdom tradition, is the spiritual life and practice; for this of the true foundation of an genuine spirituality and any real progress in the evolution of the soul to Higher Consciousness and Self-realization. Thus, our spiritual life and practice is the essential vehicle of Gnostic Christian. If in faith we take up the spiritual life and practice, there is no doubt that through the Grace of the Creator and Holy Mother we will experience something of the Truth and Light, and to some degree Divine Gnosis will be made manifest. Initiation to Sacred Order of Knights of the Rose is open to both men and women of all ages, all cultures, social economic status, and spiritual paths who belief is understanding the spiritual path by knowing one's Self fully by experiencing our own Inner Wisdom; dedicated to living in accordance with the ideal of the spiritual warrior, one who is able to effectively, and without fear, meet any and all challenges that life places in his/her path. 1) In a manner that is appropriate to you, before Divine God and Holy Mother, as a child of them and before them create your own ceremony or sacred ritual of initiation to the order. 2) Declare your search for the Christ within. 3) Declare your life to following that path through study and example. 4) Be humble, chivalrous, brave, honorable, compassionate, honest, and true. Be tolerant. Be protective of those unprotected. Do not be boastful or proud. Be an individual where your word is your bond. Say what you think and think what you say. Do the right thing always. Once you have declared yourself you may call yourself a Knight of the Sacred Order of Knights of the Rose. There are no dues, no uniform, no monthly meetings, only the desire to live the life outlined within these pages, and share this order with those who come to it of their own free will. There is no hierarchy within the Sacred Order of Knights of the Rose. Those who are initiated into the Sacred Order of Knights of the Rose are known by one another as Brother or Sister; this not a title but an acknowledgement of family. Those non-initiated are simply known as friends or “Friends of the Rose”. A brother or sister running a Gnostic circle may be referred to as Prior. The seal of the Sacred Order of Knights of the Rose may be worn or displayed in an honorable manner by any member of the order in its entirety or simply as a rose itself. The rose was once a symbol of purity and a symbol of passion, heavenly perfection and earthly passion; virginity and fertility; death and life. The rose is the flower of the goddess Venus but also the blood of Adonis and of the Christ. It is a symbol of transmutation. The rose garden is a symbol of Paradise. It is the place of the mystic marriage. In ancient Rome, roses were grown in the funerary gardens to symbolize resurrection. The rose has also been associated as a symbol of that which is hidden. This is our symbol, the rose. This symbol is a variation of the traditional Christian cross. The circle that circumnavigates the intersection of the cross is often believed to represent a fusion of the old ways and the new. It is said that St. Patrick combined the Christian cross with the sun cross that is used by Pagans.